The largest institution of its type among the eastern Cherokees, Brainerd Mission was a multi-acre school near Chattanooga. Brainerd Mission was a multi-acre mission school situated on Chickamauga Creek near present-day Chattanooga. Named for eighteenth-century missionary David Brainerd, it was the largest institution of its type among the Eastern Cherokees. 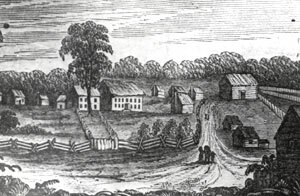 The Boston-based American Board of Commissioners for Foreign Missions (ABCFM) received the Cherokees’ approval to establish the school in October 1816 and began classes there the following March. During its two decades of operation Brainerd enrolled more than three hundred male and female Cherokee students and employed forty ministers and teachers. While the institution was a frequent source of conflict between the Cherokees and the board, most students acquired at least basic proficiency in reading and writing, and several staff members provided Cherokee leaders with valuable political advice and assistance during the removal crisis. The Congregationalist and Presbyterian missionary founders, including Daniel Butrick, Ard Hoyt, and Cyrus Kingsbury, assumed that proper education for Indian children included instilling them with Christian religious precepts and Anglo-American work habits. Accordingly, they designed a curriculum which included Bible study, hymns, prayer, and vocational training (stock-raising, gardening, smithing, and carpentry for boys and domestic chores, spinning, and weaving for girls) as well as the “three Rs,” grammar, and geography. Lessons followed the Lancastrian plan, wherein older and more accomplished students helped instruct their younger counterparts. Rigorous discipline included corporal punishment for infractions of the school’s code of behavior. The Brainerd missionaries enjoyed some success as teachers, helping at least one hundred students achieve high levels of proficiency in English and reading and sending several young Cherokee men to the ABCFM’s Foreign Mission School in Connecticut for further instruction. Few students joined the mission’s Congregational church, however, and many parents objected to the missionaries’ use of corporal punishment and the agricultural chores required of male students–unsuitable work for men, according to Cherokee norms. Moreover, the missionaries’ pronounced bias in favor of bicultural students alienated full blood children and their parents. Consequently, the number of full-blooded Cherokees at Brainerd fell by one-third between 1821 and 1825. The ABCFM initially charged students one dollar per week for tuition and board but eliminated these charges in 1819 to boost enrollment. Funding for Brainerd and for the board’s seven other mission stations in Cherokee territory came from private contributions and from the U.S. government, which gave the ABCFM a large (one thousand to two thousand dollars) annual grant. Using these funds, the Brainerd missionaries provided their students with free instruction, board, and clothing and financed the construction of an extensive mission complex which included separate boys’ and girls’ quarters and schoolhouses, housing for the missionaries and other instructors, a church, two mills, and a garden. In 1824 Cherokee leaders expressed concern over Brainerd’s rapid expansion and asked the National Council to prohibit further hiring by Superintendent William Chamberlain, to which the Council agreed. Tension between the Cherokee government and the board missionaries subsided in the late 1820s, however, as the two groups joined forces to resist removal. In March 1830 a fire destroyed much of the central part of the mission, and classes and religious services could not resume for two years. In the mid-1830s Brainerd became a refuge for missionaries and Cherokee congregants driven from the ABCFM’s smaller stations in Georgia; by 1837 the Church of Christ of Brainerd included a record 110 members. The expulsion of the Cherokees from the Southeast the following year forced the ABCFM to permanently abandon the site. Brainerd’s staff held their final religious services in August 1838.